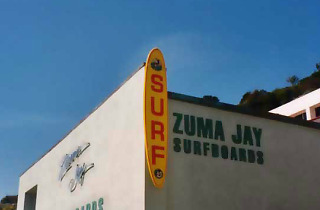 Family-owned Zuma Jay’s is a Southern California icon, proudly holding the title of Malibu’s oldest surf shop. Owned by surfboard shaper and all around interesting guy Jefferson Wagner, Zuma Jay Surfboards sits just south of the famed Malibu Pier. A law student in Northern California, Jefferson was drawn to Southern California and surfing by "the romance of the ocean and the indignity of high-rise buildings," he once told the Malibu Times. Today, Zuma Jay is a licensed Hollywood stuntman and the former mayor of Malibu who once wrote a book on the history of surf wax. He can often be found behind the counter of his shop, and while word is he can be a bit rough around the edges, one thing can’t be disputed—he loves Malibu, and he loves surfing.